Kyle Browne (AP '17) is showing work in the In Time Film Festival at the School of Visual Arts this Friday, April 28. AP Student Kyle Browne exhibits at SF Arts Commission in the show "Not Alone: Exploring Bonds Between and With Members of the Armed Forces". AP Student Kyle Browne shows in two exhibitions at aratiol, Wairarapa Museum of Art and History in New Zealand. On Thursday, April 14 at 7:00 pm join The Umbrella Community for The Art of Environmental Activism featuring Kyle Browne (MFA AP16), Ellen Callaway, Mags Harries, and William Turville. The discussion will be moderated by C.C. King, one of the founders of the Musketaquid Arts and Environment Program. These four artists will discuss how their visual artwork incorporates the environment and activism around the environment. From photographs of recycling and recycled sculptures to large scale public art installations, these artists are well-versed in what it takes to create in collaboration with the environment. 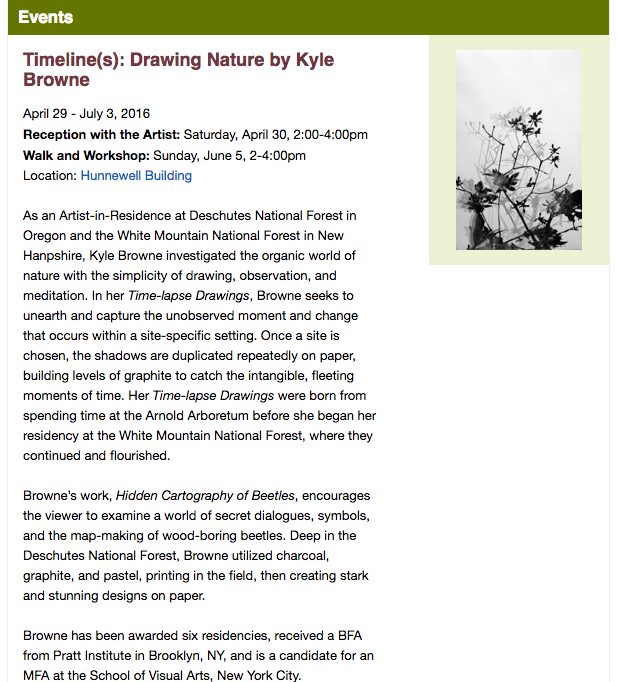 Kyle Browne (MFA AP17) will be exhibiting at the Arnold Arboretum of Harvard University opening April 29th through July 2 with Timeline(s): Drawings of Nature. Browne seeks to unearth and capture the unobserved moment and change that occurs within a site-specific setting. For more information on the opening reception, follow this link.